Lisa Jacobs (VIS) became Australia’s first Women’s National Cyclocross Champion in August. 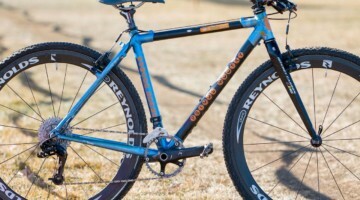 But it wasn’t until September, at the first-ever UCI cyclocross race in China, that we got a closer look at Jacobs’ unique Apollo Bicycles’ carbon Arctec CX that she propelled to victory in Australia at the 2013 National Championships and 14th in China. Take one look at the top tube and seatstays and you’ll see it’s a unique frame design. 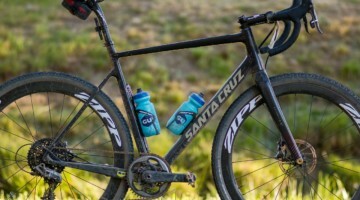 The frame features GT-like seatstays that meet the top tube in front of the seat tube, but without the “Triple Triangle” that GT creates by continuing the top tube all the way to the seat tube. It’s not the first time we’ve seen a national champion race with such long seatstays, as the McCormack brothers of Saturn won plenty of races on their steel GT bikes (seen here), but it might be the first on a carbon frame. Jacobs actually got the Arctec CX just in time for the Australian Nationals, after having ridden Apollo’s $1599 (AUS) SRAM Apex-equipped aluminum Xact through the 2012 and 2013 seasons. 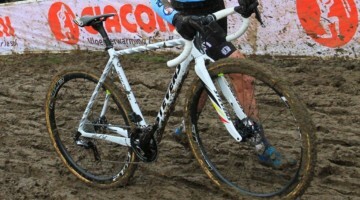 In fact, Jacobs powered the Xact to the 2012 Australian Cyclocross Series Championship before sitting down with Apollo to develop the Arctec CX. The Arctec CX is now featured in Apollo’s lineup, but the bike Jacobs rode at Nationals was none other than a prototype, shipped directly from its trade show debut. With help of a Victoria Institute of Sport mechanic and the local Apollo dealer, the bike was ready to race. The first thing one notices is the unique shape of the frame, made from hi-modulus multi-weave Torayca carbon from Toray. 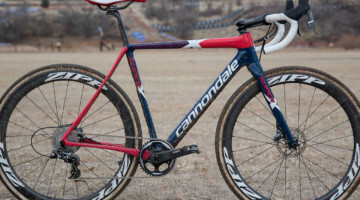 Speaking of bump absorption, Jacobs has some custom-colored FMB 33mm SSC tubulars to show off her Australian Championship stripes and give her bike a unique look (in case that unique top tube isn’t enough). How are you supposed to shoulder that thing? Norm Gray, yup that’s what we say in the profile. Do you know what brand? 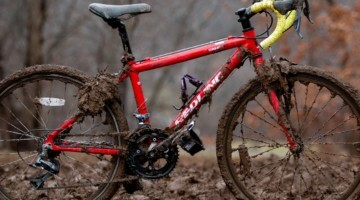 @Brad Evans The same way you would any other cx bike…? You mean because it has a bottle cage? That is a TROPHY BIKE nice! 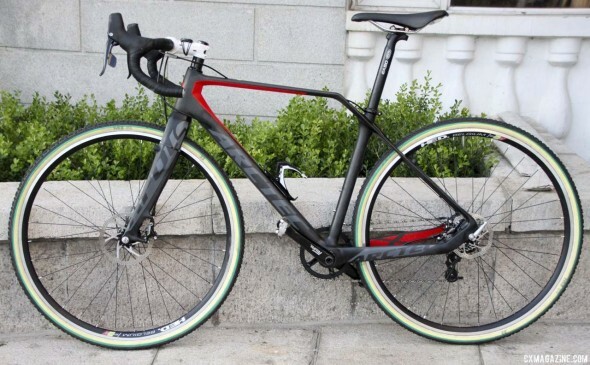 While I am not normally a traditionalist just for the sake of looks, I have to say that this might be the ugliest bike I have seen in quite some time…. It was pretty hot in China and not everyone had a pit crew…thus the cage. 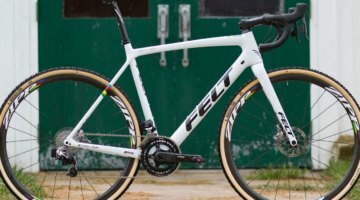 This bike came together pretty quickly for national champs and China. Lisa ride it for the first time in the National Championship race. The end product will be more nicely finished. Black stem, SRAM red cranks, carbon post, carbon wheels and of course no bottle cage for worlds in the snow! Just over 7.5kg makes it a weapon! 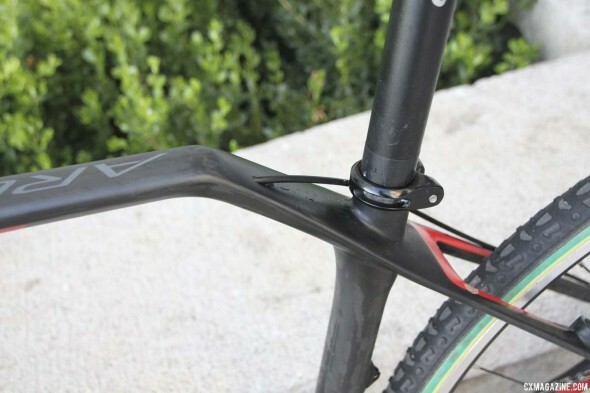 It would make even a better idea if it was a seat mast to give the bike a softer seat tube. And the fulcrum point would be well placed. BeardedManRT Pierre Middleton, vive la France! They look awesome mate any news on the red ones?